I finished off with a loopy bow decorated with a button and pearl. For new readers, every Friday it’s my pleasure to give away a card. The card goes to a randomly picked reader (worldwide) who leaves a comment in our conversation. Want to know more about Day of Giving, here’s a link to my FAQ’s just check out #11. You can check to see if your name is on the list of winners HERE. For your comment: Which do you give more, holiday cards or anytime cards? 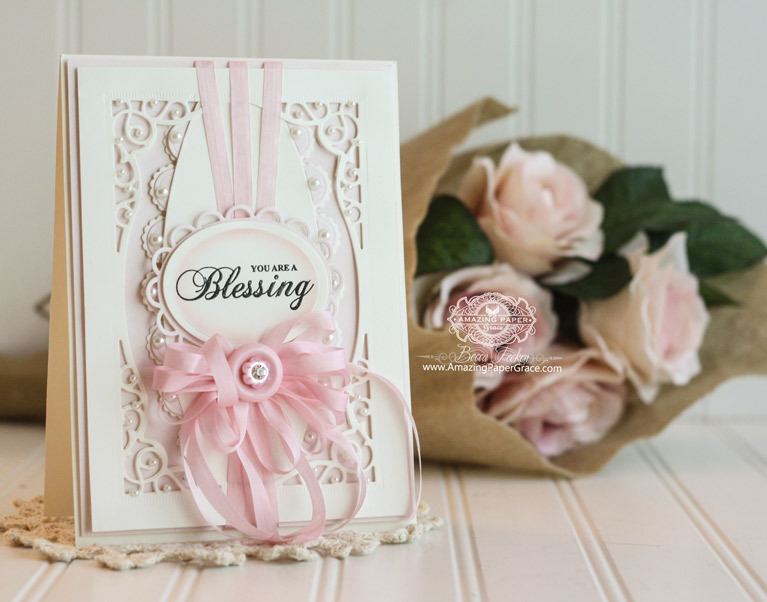 Accessories: Spellbinders Majestic Labels Twenty Five, Spellbinders Lacey Ovals, Spellbinders Classic Ovals SM, Recollection Pearls, May Arts Silk Ribbon, Button Someone in your life need a card? Brighten a life – send an anytime, just because card – it’s good for your sweet little soul! Becca, your words just brought tears to my eyes today because you really never know when you send the “just because” card how much it will touch someone. In this day of social media we are losing the gesture of sending cards “just because”. We text, we instant-message, but we are often too busy to send something beautiful like this card of yours. You are an inspiration to us all. Hi Becca. Hope you are healing well. What a great idea to just send a card. I usually send cards for some occasion mostly birthday. Becca, all your cards are so beautiful and I’d love to receive one. The cards I send out most are just everyday cards. I love to send them to my family to let them know how much I care or to just give them a little chuckle with the humorous ones I send. Definitely more of the anytime cards–thank you, get well, thinking of you, etc. I love sending an encouragement card, hoping to make a whole lot more once my craft room is completely overhauled, and I just bought a new electric die-cutting machine (Gemini by CC), and am hoping that this is going to make die-cutting and card-making a lot easier physically. Can’t wait to try some watercoloring on images heat embossed in white or clear, I really want to try this, and I’m hoping I can do a decent job. Gorgeous card! I love your loopy bow, such a sweet addition. I love to send “just because” cards at any time, for any reason. Who wouldn’t want to find a gorgeous hand made card in their mail box, talk about a spirit lifting moment! I can visualize smiling faces now. I also made it a mission of mine to make a project every year for the ladies at my church, then I mail it to them on their birthdays, it is as much of a pleasure for them to receive as it is for me to make, thinking of each of them as I assembly the project. So far I’ve done cards with flower bouquets, cards with a hand colored image and this year they get a puff pillow box, with flowers and a mini birthday card inside. 2017 will be a tag with a Magnolia-Lucius image colored on it. Oh how I love to brighten other people’s day? Absolutely stunning card! I send occasion cards – birthday, wedding anniversary, congratulations, thank you, baby, greater numbers probably in that order. I don’t send Christmas cards, preferring to donate to a third world charity, and have done so for 28 years. Hi Becca a beautiful card , i always feel good when i send a Thank You card . Happy Friday and Day of Giving! Just another beautiful card – one after the other! You never stop creating such georgous cards. The Majestic Labels 25 is one set of dies that I have not purchased but will now be on my list. Hope you have a fantastic weekend and that your foot is healing from God’s graces bestowed on you. Oh my gosh, so beautiful!! You are so blessed with a beautiful skill!! Love you cards! I actually think, I do more anytime cards than holiday cards. Especially the last couple of years life has been a bit rough, so I haven´t got as many holidaycards done, as I used to earlier, but I alwayas manage one way or another to get them at least one card during the year, either for their birthday or sometime else, or just because, and that´s because all other people make or get cards to give for these special occasions, but then I´ll make one for some other time, when they least expect it, and it can hopefully make their day at that time. This card is one of the most breath-taking I have ever seen. I was totally stunned when I opened the page. After several years making and looking at cards made by others, I’d say it is not easy to take my breath away. I give more anytime cards. It just so good to keep in touch with family and friends. I so love your cards and especially your dies! As to what cards I make the most, I’m on the design team for Crafters companion so I rarely have the time to make cards to give “just because” although I do try to for both our parents as they do so much for us. It’s our 17th wedding anniversary today and I’ve been so busy with dt work plus we’ve just moved that today is the first time since I’ve been making cards that my poor hubby didn’t get one. When I apologised he don’t worry I have loads you’ve made me. Hey, Becca. I notice that the last several times when I comment I’ve had to type all my information in. Normally it’ll auto populate with the first letter. I send more holiday cards but anytime letters, I never seem to get caught up on cards and letters to g out. This is such a beautiful card, Becca. Beautiful card, Becca! Great for many occasions! Hi from Australia Becca, hope are recovering well. The most cards I make and give out are birthday cards and the next are Christmas cards. YOU are a blessing! I can see why you duplicated this card – it is so beautiful, sight and sentiment. While I do make a lot of cards at the holidays, especially Christmas, I make cards for my church and community choirs to reach out to our members in greater quantities. “Thinking of You” cards for Sympathy or health concerns are the most common, with “Thank You” cards in the mix, as well. I am challenged to keep up with demand, but I am honored to have many people around me that appreciate and encourage my craft. Your card is GORGEOUS Becca…love the sentiment!!!!!!! Would really love to win this card – it is SPECIAL! I give more everyday cards than for holidays – although I give a bunch of those too – LOL! This is such a beautiful card. Can you really bear to part with it…. The ‘just thinking of you cards’ are so important and I am trying to send more of them as they are real spirit lifters! I know how lovely it is to receive such a sentiment. I send about 200 Christmas cards and it would be pretty hard to catch up with that number, but you never know…. Hope your foot is healing well and that you are having great times with your mother! Hi Becca I give all my cards away have never sold one ! shop for their own or can’t afford to buy special cards. are happy twice lol . Personally my cards are a mixture ! Good morning Becca, what an absolutely stunning card anyone would love to receive!!! I would say I do more Christmas and birthday!!! You’ve certainly got me thinking though!!! Oh Becca this is fabulous – I probably send/give more birthday cards than anything else, although I do love to send a card ‘just because’. The only holiday cards I do are Christmas cards. After that it’s birthday and thank you cards. I’ve not done all occasion or just because. I don’t really know why. I should do this, especially knowing how a handmade card can make a person feel. I love love love this beautiful card and I’m happy to say I have these dies so I’m going to make my version. Super excited but I’d love to have your card. It’s pink…even more reason to love! 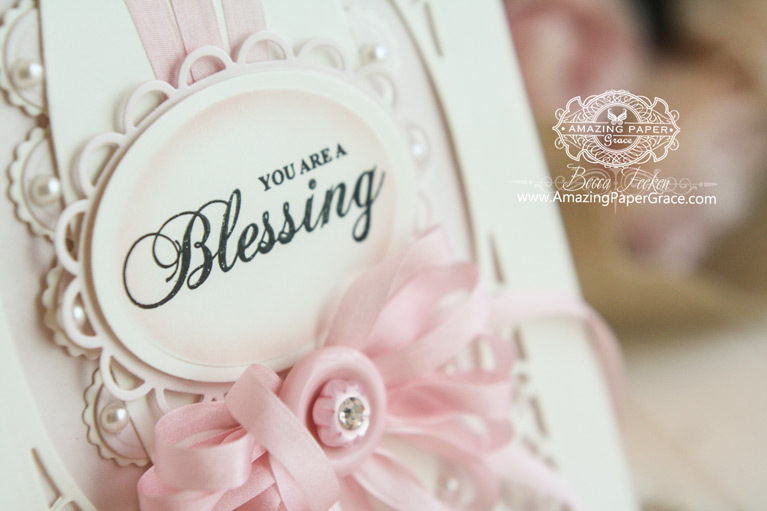 Hi Becca, This card is stunning, gorgeous die-cuts, gorgeous ribbon and bow, gorgeous sentiment. I love this !! Your website is my go to site for card creating ideas. It saves me a lot of time. Thank you so much. Gorgeous creation. I guess I give anytime cards as we don’t do hoilday’s cards over here, at least I have never heard of it lol! We give the usual birthday/anniversary/wedding etc but also Thank you & thinking of you cards. dear Becca, you are a blessing for all crafters ! I like to give cards for every day,just to show :I am thinking of somebody. Once again another beautiful card!!!! You make simplistic so ELEGANT!! I love & admire your talent!! Just for the joy on the face of a recipient given a ‘no occasion’ card is a pleasure to me. Such a beautiful card and loving the Spellbinders dies. What a lovely card & lovely idea. I guess not only will it cheer the receiver but it makes the giving person happy. I always like giving gifts etc more than I enjoy receiving. I make more birthday cards than anything. I think I will have to take on the just because idea as well. Hi Becca another beautiful card , i send more for the occasion cards now because i have not got much time. Beautiful card! This is my first chance to post a comment on Day of Giving. I am normally not on my computer on Friday’s but with all this rain, it is an inside day for sure. I mainly give birthday and Christmas cards so I guess I fall under the holiday giver. I do love to make cards but I hope one day I can make cards like yours without having to copy.